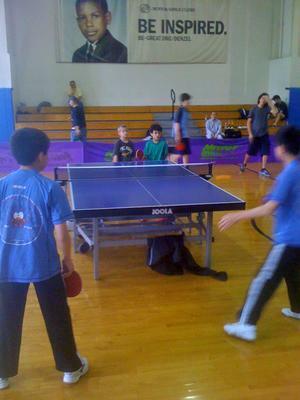 Grenville Baker Boys and Girls Club is located in Locust Valley, New York, USA. Our club began in 1947 and is a local affiliate of Boys and Girls Clubs of America - a national organization whose mission is to enable all young people to reach their full potential as productive, caring, responsible citizens. This club is essentially only for local Boys and Girls Club members so all players must have a student membership in the club. We have four table tennis tables and we have about 50 players on the challenge ladder. The table tennis club runs democratically with students electing student supervisors who run it 6 days a week. Coach Jerry Mintz volunteers twice a week for 2 hours. Some people bring their children so he can teach them. Jerry Mintz provides coaching of the students. We host a USATT sanctioned New York State Junior Championship every year, usually in April, May or June. There are age divisions from age 8, but one adult open.